The Istana Nurul Iman (The Light of Faith Palace) is considered the world’s largest residential palace in terms of the floor area. It is the official dwelling place of the 29th Sultan of Brunei, Hassanal Bolkiah, and also acts as the headquarters of the Brunei government. The mega palace is located along the pristine shores of the River Brunei, five miles south of Brunei’s capital, Bandar Seri Begawan. Breathtaking views of the place are clear from the adjoining Persiaran Damuan Park. Visitors can enjoy the panoramic view of the profligate palace designated by curved rooftops and the golden dome of the mosque rising above the tall tropical trees on a boat ride on the Brunei River. Istana Nurul Iman is a massive white construction covered in golden domes and towers covering approximately 2,152,782 square feet of floor space. The exterior of the palace was conceived by a Filipino architect, Leonardo Locsin, who integrated Brunei’s Islamic architecture with Malay traditional designs. The interior was designed by Khuan Chew, who also designed the Burj Al Arab in Dubai. The two architects tried to blend the palace with European and traditional Malay architecture to give it the magnificent look. The antique architecture is mixed with ultra-modern luxurious décor of Italian marble, Shanghai granite, Chinese chalk, and English glass. 38 different kinds of marble have been used in the interior décor of the palace. Due to the large size of the palace, there are 44 staircases and 18 elevators made of antique and diverse marbles. The construction of the palace by Ayala Corporation commenced in 1981 and ended in 1984, during the time when Brunei attained full independence from Britain at a cost of $1.4 billion. It contains 1,788 rooms which include 257 restrooms, a mosque accommodating 1,500 people, a ceremonial hall accommodating up to 5,000 visitors, 5 large swimming pools, and an aerated stable holding 200 polo horses. In addition, there is a 110 car garage and parking lot for the Sultan’s 65 custom-made Ferraris, Lamborghinis, and Bentleys as well as 165 Rolls Royces, and 37 Bugattis. Istana Nurul Iman acts as the official dwelling residence of the Sultan as well as the official house for Brunei’s government functions. The Sultan makes his official statements in the Audience and Staterooms inside the palace. Additionally, the palace also hosts the prime minister’s office and the Throne Chamber used to hold official functions such as the annual inauguration birthday and decree of the Crown Prince. 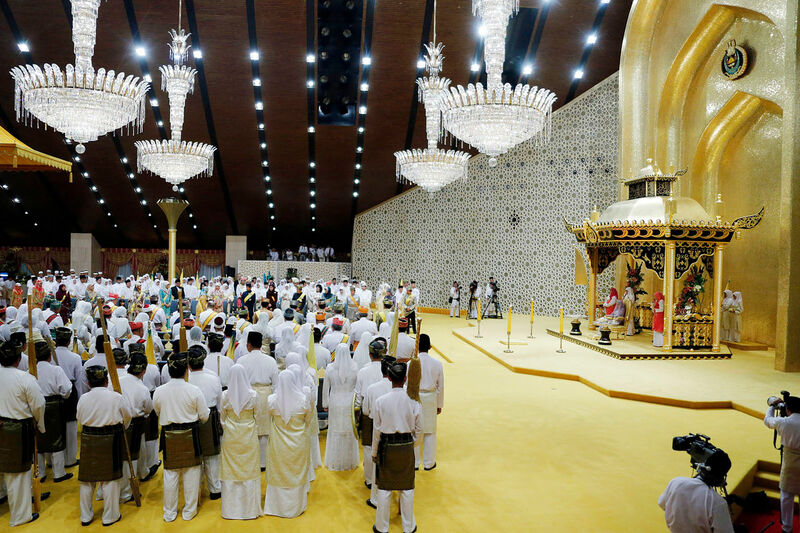 The palace only opens its doors to the public during the annual Islamic celebrations such as the Hari Raya Aidilfitri celebrating the culmination of the fasting month. During this ceremony, the palace hosts about a hundred thousand guests over a three day period when they receive food and gifts containing money for young children. It also opens its doors for 10 days during Ramadhan for Tarawih and Tadarus prayer sessions. Besides, the palace also acts as an art gallery containing a large collection of paintings from renowned artists such as the Renoir painting, purchased by the Sultan for $70 million.